One of the biggest challenges as a parent can be getting your kids to go to bed on time while following the routine. This is also one of the areas that kids can try to exert their independence and strength. Having a routine can help kids know exactly what to expect and keep them from deviating from this routine. Jack was a great sleeper until the day I had minor surgery on my leg when he was two. Before we would read a story and put him in bed with his blanket and he would fall asleep. The night after my surgery he went from peaceful sleeper to screaming boy. We couldn’t understand why he wouldn’t lay down and he actually climbed out of his crib for the first time. Jim and I spent night after night sitting in the hallway waiting for him to climb out, periodically telling him to lie down. After a few weeks he settled back into a routine and stopped crying out, but he was never quite the same. About a year later Jack went through a few months where he would wake up in the early morning having peed through his overnight diaper and his bed was soaked. We tried changing diapers, using plastic diaper covers, restricting liquids, getting him up to pee when we went to bed and nothing helped for very long. Then Jack started to get anxious about going to bed. He was afraid that he would wake up wet, so he would want to keep getting up to try to pee. We ended up creating a checklist and at the end of the checklist it would be time for bed. Our bedtime troubles have been minor compared to what some of my friends have experienced, but having a routine can help even extreme bedtime issues. Here are some tips when creating a routine that worked for us. 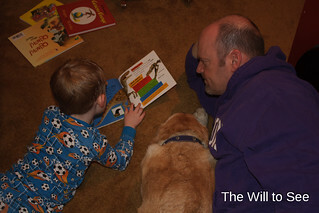 · Read stories – I have found that reading to my kids helps calm them down and make it easier for them to fall asleep. · Empower your child – Let them pick the book to read and pajamas, maybe even what tooth paste or toothbrush to use. This gives the child some power, but keeps you in control of the evening. · Same bedtime every night – This helps the child’s body clock know what time to sleep and it will start to slow down. Although it can be tempting to keep the child up to have them be more tired, this make the child over tired and even harder to get to sleep. · Make a checklist – For kids old enough to understand checking items off a list is helpful to move through the routine and not allow other items to creep in. The child knows what is coming and gets the pleasure of checking things off after they are completed. · Relax and enjoy cozy time – As kids get older they may not want to sit and snuggle while reading stories, so enjoy this time. Children also can feel their parents’ tension and stress. If you are relaxed they will be more relaxed. · Use a noise machine or music – Some children are distracted by sounds around them. Having a noise machine or music playing can help them relax and not wonder what else is going on in the house. My boys both use noise machines which also help provide consistency when sleeping in other locations (while on vacation, camping, sleeping at our friends’ houses etc.). Hopefully these tips will help you get through your bedtime routines with less fighting and more fun. This post is also on Girl Power Hour – Mommy See.